Saturday August 31st 1878 We worked very hard today. I went to town in the forenoon for things I had to have about my baking. Our company all came in the afternoon and we had a real pleasant visit. The boys did not come in from the field till after dark. It was time to go to bed before we got our dishes washed. Weather quite warm. 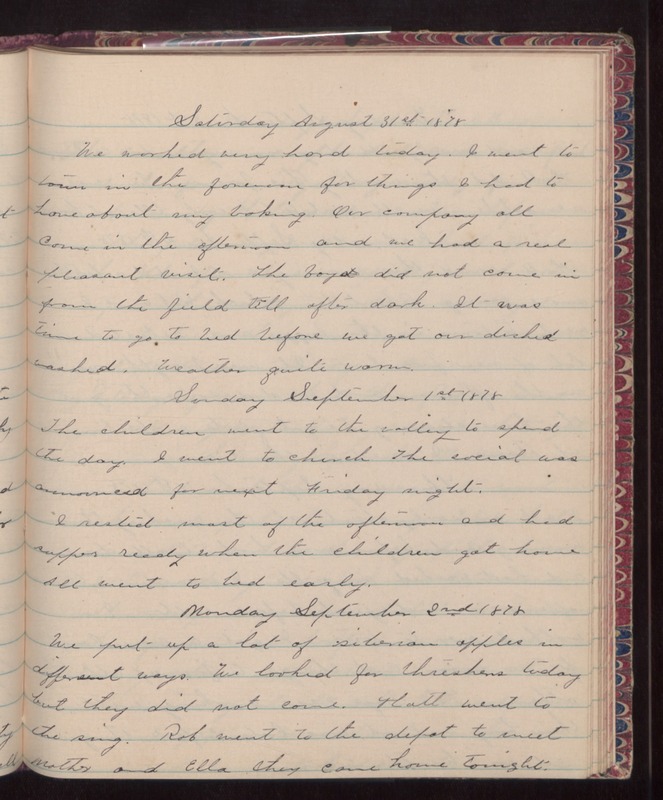 Sunday September 1st 1878 The children went to the valley to spend the day. I went to church. The social was announced for next Friday night. I rested most of the afternoon and had supper ready when the children got home. All went to bed early. Monday September 2nd 1878 We put up a lot of siberian apples in different ways. We looked for threshers today but they did not come. Hatt went to the sing. Rob went to the depot to meet Mother and Ella. They came home tonight.